LEXINGTON, Ky. (Feb. 27, 2018) — When Eric Scott (2008, College of Communication and Information) saw his football career come to an end after two years in the National Football League, he knew two things: He wanted to finish his master’s degree, and his future career was not going to have him stuck behind a desk. He had no idea that mission would lead him to where he is now … as a lieutenant in the UK Police Department. 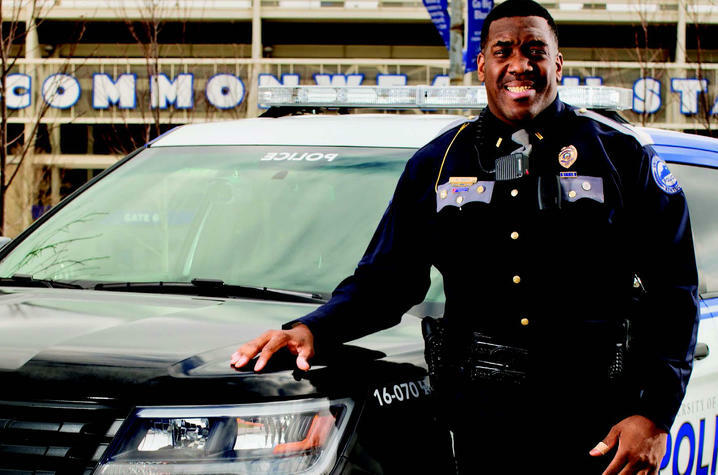 Scott, who played football at UK from 2003-2007 and then played two seasons for the NFL’s Tennessee Titans, has been with the department for eight years. He says it has been the best career he could have hoped for. Scott did not know it at the time, but his interest in law enforcement began during his playing days at UK. Kevin Franklin, a captain on the force, was one of the officers assigned as security to accompany the football team on road trips. Scott says Franklin became a good friend and mentor at UK, and they reconnected when Scott returned to Lexington to finish working on his master’s degree. “When I got hurt, I decided to come back to Lexington,” Scott said. “I went to a career fair because I was looking for a graduate assistant job to pay for the second half of my master’s (degree). As soon as I walked in the door, I saw this giant FBI banner. All the investigative stuff they did drew my attention. “I had done internships with Wells Fargo, and I was completely miserable behind a desk. When I saw that FBI banner, it intrigued me. Next to the banner was the UK Police Force banner, and behind it were Capt. Kevin Franklin and Maj. Nathan Brown. So when I saw those two there, I kind of hit it off with them,” explained Scott. Scott told Franklin he was looking to finish up graduate school, and the police force interested him. He found out the force was hiring, which meant Scott could pay for his schooling as a UK employee. Scott’s athletic career prepared him for what law enforcement entailed. That patience was tested once Scott joined the force. He tended to be a little too recognizable, especially when dealing with students, many having been his friends just a few years earlier. Scott, who has three daughters, is happy with his life and career in Lexington now, but he is looking ahead. He has thought about joining the FBI or U.S. Marshals Service in the future. “Their age cutoff is 37. I’m 31 now, so if I’m going to do something, I have to do it within that time,” he said. Scott has also been able to give back to an athletics program that he credits with helping him become the man he is now. From 2009-2016, Scott traveled with the football team full time and part time with the basketball team on road trips. Aside from providing security for the head coach, Scott says he tried to show players different sides of the police than some of them were used to seeing. “I was a resource for players, kind of an advisor, and gave them guidance,” he said. “With my background, the players trusted me. Those guys, it’s hard for some of them to trust the police with their backgrounds. It was one of the coolest details I’ve had at the university.